OS grid reference: SJ 3998 8638. 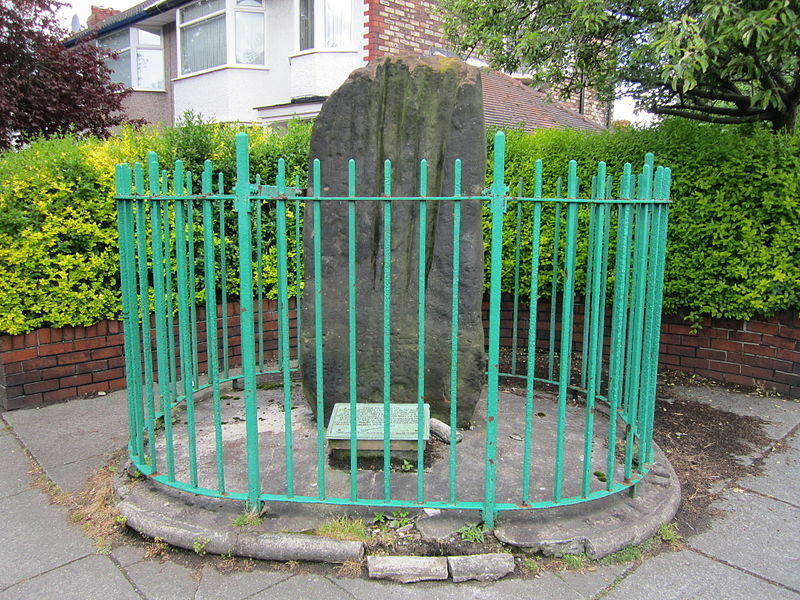 A prehistoric standing stone, now heavily worn by thousands of years erosion, stands behind railings on Brooker Avenue at the junction of Archerfield Road in Allerton, Liverpool, Merseyside, near to West Allerton Railway Station. The heavily grooved monolith is thought to be one of the famous Calder Stones, which now reside in the Palm House in Calderstones Park, a quarter of a mile or so to the north-east, but ‘a few’ historians have considered the stone to date from the early part of the 16th century, and in particular the reign of King Henry VIII, when arrows were sharpened upon it. Archerfield Road is a giveaway here, I think. But just where Robin Hood the famed outlaw of Sherwood Forest features in the long history of this monument I am at something of a loss like everyone else before me, but mythical and legendary heroes from our history ‘very often’ have their names attributed to stones that are: in no way “whatsoever” connected’, though it does give the ancient monument ‘in question’ a more interesting name. In 1970 a similar stone was ploughed up in a farmer’s field at Haskayne, north of the city, and this also had grooves made by thousands of years of weathering. And so it is presumed this, and the so-called Robin Hood’s Stone, were probably part of the Calder Stones which date back 4,000 years to the Bronze-Age. The Calder Stones had once formed part of a megalithic burial tomb in the Allerton area of Liverpool, but they were eventually brought to Calderstones Park and re-housed in the Palm House. But I can see ‘why’ some have considered the so-called Robin Hood’s Stone to be a relic of the early 16th century – as the deep scoring marks made by arrow-sharpening are still very visible on the stone. https://commons.wikimedia.org/wiki/File:Robin_Hood%27s_Stone,_Liverpool_(1).JPG – This file is licensed under the Creative Commons Attribution-Share Alike 3.0 Unported license. Whale, Derek M., Lost Villages Of Liverpool – Part One, (second edition), T. Stephenson & Sons Ltd., Prescott, Merseyside, 1985. Categories: Standing Stone | Tags: Robin Hood's Stone at Allerton in Merseyside, Robin Hood's Stone in Liverpool | Permalink.